HomeGIS CareerWhat is GIScience (Geographic Information Science)? While Geographic Information Systems answers “what” and “where”, Geographic Information Science (GIScience) is concerned with the "how" and its development. We’ve already looked at the definition of Geographic Information Systems. In short, GIS is the analysis, storage, visualization and management of geographic data. But there is another “S” when it comes to GIS. This “S” stands for Geographic Information Science or simply GIScience. How is GIScience Different From Geographic Information Systems? We know all know that Geographic Information Systems looks at the “what” and “where”. For example, an electric company would store its assets in a GIS system as points, lines and polygons. The “where” is their physical geography on a map. Points may be towers as XY locations. Lines may be wires that are connected to each tower. Polygons may be the areas each line services. All of these have attributes tied to them. The “what” is information about their feature. Towers​ can be made of steel, wood and other material. Wires can be overhead or underground. Service areas can have population and demographics they service. The focal point of Geographic Information Science is the technical implementation of Geographic Information Systems. In other words, it involves the conceptual ideas for how to implement GIS. As you know, there is unlimited potential toa apply GIS in our everyday lives including these 1000 GIS applications. While Geographic Information Systems answers the “what” and “where”, Geographic Information Science is concerned with the “how”. For example, GIScience conceptualizes how to store spatial information, collect data and analyze it. 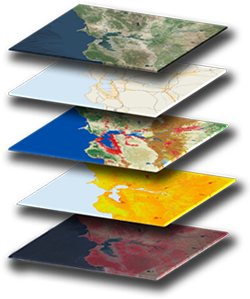 It encompasses all aspects of GIS such as remote sensing, surveying, mathematics, programming and geography. Geographic Information Systems relies on the developments in GIScience for future developments. In other words, GIScience is the building block and is the foundation for all uses of a Geographic Information System. If you want to get involved, participants from around the world get together at the GIScience flagship conference. This is where they discuss and advance the state-of-the-art in geographic information science. Since 2000, their annual conferences discusses the role of geographic information in geography, computer science, engineering, mathematics, cognitive science, psychology, social science, and geostatistics. GIS analysts and technicians use Geographic Information Systems as a software tool in every day work. But how did these tools become available? It came from GIScience which studies the data structures and computational techniques. As you know, this is the backbone of GIS systems which we use every day. Remote sensing, geodatabases and automation can play a key role in cost-effective and timely information for using GIS in oil and gas industry. Maps help us get to places. They help us make decisions. Maps have changed how we think about location. But where did it begin? We study the history of GIS.